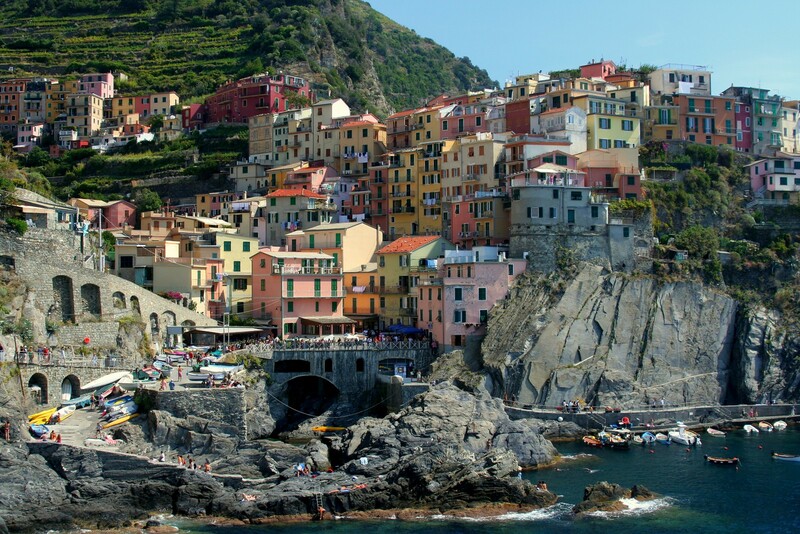 This is Manarola, it’s a small village in northwestern Italy. It’s part of Cinque Terre (which translates into something like “5 villages”) which is a national-park-y type thing along the Mediterranean coast. All 5 are little old-style villages made up of colorful buildings crammed together among the cliffs. 4 out of the 5 are right on the water, and the 5th is up on the hill a little ways. You can drive to most of them, but not *in* to any of them. Julie and I were there a couple years back for Trevor and Heather’s wedding. They got married in Vernazza, so that’s where we stayed. We were in Cinque Terre for 4 days or so, and it was AMAZING. This picture was I think taken on the day of the actual wedding. Trevor and I had some time to kill before the ceremony, so we hopped on the train and visited a couple of the towns. As hinted at a few days ago, I think the midday lighting hurts the picture, but if that’s the only time you can be somewhere, you take what you get. Notes: Canon EOS Rebel XT, Tamron 28-300 mm lens. 1/200s, f/7.1, ISO 200. Focal length: 28mm. I’ll have to add that place to my list of places I want to visit. It looks like a water color painting. It’s magnificent. Thank you for sharing this one.. I love Italy. I only wish I had a digital camera when I lived there. I have some good pictures, but they are all prints and negatives.